A month ago, I attended and got to “stand in” on my friend Mike’s baby blessing. Listening to him bless his baby was a wonderful thing – hearing his thoughts and thoughts and feeling the Spirit. Why do we name and bless children in the church? The ordinance of naming and blessing children requires authorization from the presiding authority, which is usually your Bishop. States that the blessing is given by the authority of the Melchizedek Priesthood. Gives a priesthood blessing as the Spirit directs. Only worthy men who hold the Melchizedek Priesthood may participate in naming and blessing children. Things seem to be very difficult in my life right now with one thing after another going wrong. I’ve been depressed and stressed out. I admit, I did not want to go to Church on Sunday. The night before, I only had two hours of sleep and it was already 8:15am when I woke up. Sacrament started at 9:00am. I almost rolled over and went back to bed, but didn’t. I felt I had to be strong, if not for myself than for my children. After an agonizing wait to get everyone ready and loaded into the minivan, we arrived at church. It was 9:30am when we arrived. It’s a bad feeling when I miss sacrament. Something I used to view lightly when I was growing up in Catholic Church now meant so much to me. It meant that I can start over and wash away anything less than righteous from the week before. I sat in the lobby feeling empty and didn’t even try to enter the chapel. There I sat for about ten minutes until the thought came in my head: “You can leave church, you missed sacrament anyway.” No, I couldn’t do it – I was already there and I remembered that I DO actually get something out of the other Sunday School and Priesthood Meetings. Besides, the children would learn something new and enjoy their Sabbath day. The last twenty minutes went by easier. The Sunday School Gospel Essentials lesson was a review on the Second Coming of Christ: The signs of the second coming, the gathering of the house of Israel (the story of Abraham, Isaac and Jacob), the Second Coming of Jesus Christ and the Millennium. And there was one more thing – integrity. Then our teacher started touching points of his experiences at his caucus the day before. Priesthood Meeting was good. We sang “I am a Child of God” as the opening song and then everyone shared their missionary stories and the bishop talked to us about fulfilling our home teaching. Both ways – meaning that if you had not been contacted by your home teacher, seek them out and get it rolling! Afterwards, I spotted my home teaching companion and my assigned member and we scheduled an appointment. I had a home teaching appointment with my companion and family at 3:30pm. 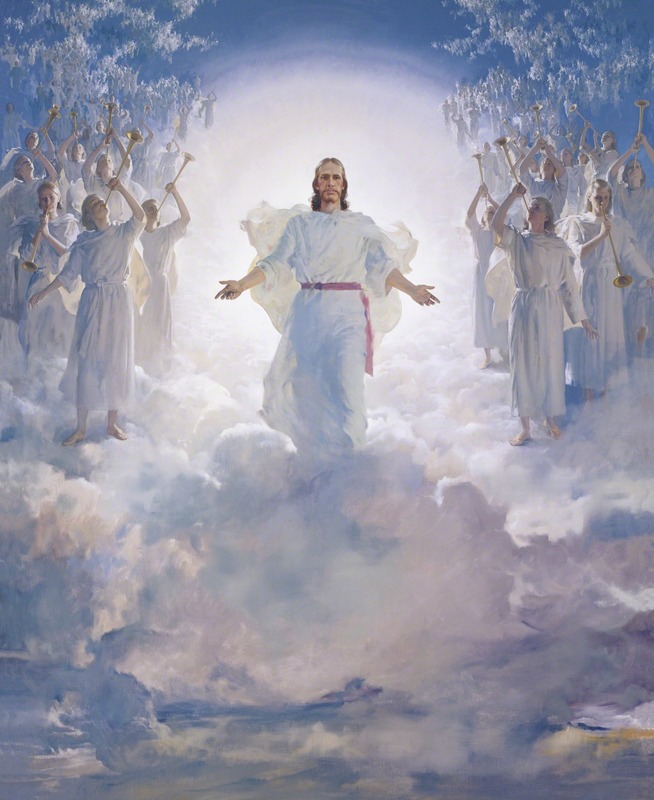 After Priesthood Meeting, we went to Elders Quorum where we had an abbreviated lesson on God the Eternal Father and the true nature of the Godhead. I left for home feeling like I didn’t really get anything out of Church and that my Sabbath day was wasting away. I napped from 12:30pm until about 1:30pm and then I could not get back to sleep. I searched for and pulled out my unopened January issue of Ensign and began to read the First Presidency message to see what I would teach my family. I read it and thought I was ready to go. My home teaching companion finally came and he met me at my house. We walked down the street to the family’s home and walked in. He saw that I had my Ensign and he was excited and he left his in the car. After some small talk, we began our lesson with my giving the invocation prayer. My companion offered me the lead and I refused. He kindly took the lead and delivered it like a professional. After he had done his part and gone through the lesson about how Jesus Christ built bridges, I finally added in my two cent about how Obedience, Service and Prayer has helped me in the past year. There was some more small talk and then my companion gave the benediction prayer and we left. I felt enlightened and really took something away from my time at their home. My companion and I was walking back to his car when he asked what seemed to be a routine question. Usually I am prideful or embarrassed so I give the routine response back, “Oh nothing, we’re doing fine.” Not this time, something came over me and I humbled myself and told him. I told him about my problems and he counseled me. My first problem was about my expensive plumbing issues with my house. It turned out he has ownership in a plumbing company so he said he would help me. My second issue was about my mortgage situation. My ARM adjusting for the 3rd time and my payment going ridiculously high. How high? So high I could be living in a house three times the size of the one I have now. He told me I should talk to the Bishop, if the plans that I have to fix things do not go through, perhaps it can be arranged that someone who is a mortgage expert in the stake can help me. He told me to make an appointment with the bishop. “This is easy” he said. He then looked at me again and asked me again, “What else?” My heart lightened and then continued again about another issue that has been weighing on me. My third issue we discussed as well and he again gave me some advice and suggested that I talk to the bishop about it. My meekness was now obvious and then he asked me again. “What else?” I replied “Nothing else.” He smiled and we talked for a while more. We then were going to part ways and instead of a shake he gives me a hug. It was just what I needed. I really appreciate him and I hope I can somehow convey that fact and help him one day. What else good can come from doing home teaching? At 6:00pm we had a dinner and family home evening scheduled at my new home teacher’s house. I am glad that we went and that they took time out to visit with us. It was very fun and we got along very well since were all pretty similar in age. It also helped that they have very loud boys as well and we felt right at home. I really appreciate my home teacher as well, with everything he has done for us. We were on the subject of large families and I cannot forget what he said to me. When dinner was over (it was a very good one) and it was time for Family Home Evening, he began and showed me how it was done. All the boys in the room lasted less than five minutes and then the lesson was done. I actually relieved to see it doesn’t last long for him either. After about three very fun hours at their house we left and went back home. When we got home I realized that I only had a total of three hours of sleep. I quickly fell asleep feeling satisfied, content and at peace. I can say that not giving up faith, being obedient, service, prayer and being meek do have its rewards. I admit, when I first started going to Church I wanted to call the Bishop the Warden instead. I wanted to do so only because the Church was called a Ward. It seemed fit that the Warden would be in charge of the Ward. It took me two months to get that out of my system and I’m happy to report that I never once slipped up…at least I don’t think I did. I don’t know if my Bishop will ever know how much I admire and appreciate him. Not because he holds a prestigious title, that he presides over Sacrament or is in the highest office of the Aaronic priesthood. The reason why I appreciate him is because he is just a man. He is a man who is kind, caring, humble, sincere and the first one to admit his faults. If I did not know him and saw him walking down the street, I would know he was a righteous man, obedient to the Lord. He is a man that has the Spirit with him, always. I know how hard his calling can be and he does it with a smile and with all his heart. He is one of the many men in my ward that I look up to as an example of what I want to become. He is a man that has his spiritual affairs in order. Last Sunday for Church, I caught him in his office and met with him briefly about arranging to be ordained to the Melchizedek Priesthood since I was Sustained in the last Stake conference. When he saw me, he smiled. He shook my hand and was genuinely happy to see me. We sat in his office for a second and I told him of my plans and how I wanted my best friend to ordain me. Afterwards, he told me how he was proud of me and put his arm around my shoulder. “How are you doing?” he asked me. “I’m trying as best as I can.” I replied. “The best you can is good enough and that is between you and the Lord.” Like many times before, he spoke about how he is not perfect, has his faults and he tries his best as well. He also spoke of the wonderful gift of the atonement and how he relies on it in his life. At that moment I felt the Spirit bring me Peace and Comfort. It washed away my feelings of inadequacies. His kindness and humble attitude strengthened my testimony. He made my day. He made my week. Even though I thought something horrible happend less than three hours ago when a Deacon forgot to pass us the bread for Sacrament, I felt safe and set for another week. He is just a man, but he is my Bishop. And I wish I could find a way to thank him for that.